ScuffSleeveä abrasion resistance sleeve for hoses and cables that are moved regularly or flex in operation can be provided by using ScuffSleeveä, available in 7 continuous sleeves (braided and woven) and 4 retrofit sleeves with hook and loop closure. These sleeve are available in bulk and shop spools of various standard lengths (see catalog pdf for information of the available lengths). These sleeves are sold in 50, 100 and 150 foot increments. Available in standard sizes; larger or custom sizes can be easily fabricated. 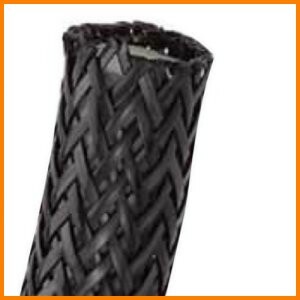 Helps to organize and bundle hoses and cables, excellent abrasion, scuff and wear resistance.